Wireform - Contour Roll 500mm x 3.05metres x 1.6mm mesh grid Wireform is a new versatile aluminium Modelling armature for sculpture, model Making, arts and crafts. 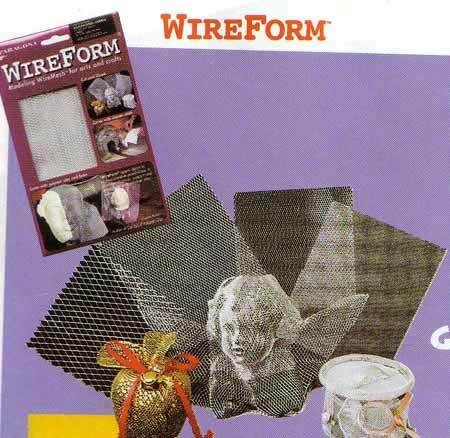 Wireform - Sparkle Roll 500mm x 3.05 metres x 3.2mm grid mesh Wireform is a fun new versatile Aluminium modelling armature for sculpture, model making, arts and craft. Wireform Studio Roll 500mm x 3.05metres x 9.5mm grid mesh Aluminium. Flex - it Mesh Medium Diamond - 500mm x 3 metres x 6mm amplitude. Flex-it mesh is an aluminium sculpting medium. The diamond weave will contract and expand, making it flexible to shape, mould and manipulate. Ideal as an armature for art modelling projects and is remarkably well priced. Wire - Galvanised 1.25mm A firm, non-corrosive, plated steel wire- For all modelling work where a firmer supporting wire is needed - easy to cut and work - Approx 100metres in length. Modelling Wire - Aluminium 3mm diameter - Specially manufactured soft annealed wire which is light, flexible, economical, non-toxic, clean, and being aluminium, will not rust. Ideal for sculpture, model making etc - Approx 50 metres length. Modelling Wire - Aluminium 5mm x 1mm Flat - Armature wire with all the flexible attributes of the round version, but with the additional structural strength - may also be less obtrusive in cross-section. Roll is approx 50 metres in length. Modelling Wire - Aluminium 1.6mm diameter - Specially manufactured soft annealed aluminium wire which is light, flexible, economical, non-toxic,clean and, being aluminium, will not rust - Approx 175 metres in length. Modelling Wire - Aluminium Blue 2mm x 10 metres - DISCONTINUED - while stocks last. Modelling Wire - Aluminium Gold 2mm x 10 metres - DISCONTINUED - Now gone. Modelling Wire - Aluminium Green 2mm x 10 metres - DISCONTINUED - while stocks last. Modelling Wire - Aluminium Red 2mm x 10 metres - DISCONTINUED - while stocks last. Modelling Wire - Aluminium Purple 2mm x 10 metres - DISCONTINUED - while stocks last.